Should I Buy Bitcoin or Gold? What Is the Best Gold ETF to Buy in 2018? It bears repeating: The gold bull market is back! I admit that's a big statement, and I believe the implications for every single investor are profound. It will mean much, much higher gold prices, of course - a historic bull run that no investor will want to miss. How high is gold likely to go? I think we'll see $1,400 this year and, eventually, $5,000 before this bull run is over. We all know gold is an excellent way to protect your wealth in times of market uncertainty and political turmoil. But gold has also become one of our favorite profit opportunities in 2018 thanks to the Federal Reserve's rock-bottom interest rate policies over the past decade and political tensions in Asia. In fact, Money Morning Resource Specialist Peter Krauth believes gold prices could rise 300% by 2020. During the last U.S. recession, U.S. households lost roughly $16 trillion in net worth. However, gold bugs were able to make a profit of almost 100%. I couldn't be more excited for gold's potential this year. Both 2016 and 2017 were positive years for gold, despite the precious metal's price action. In fact, gold gained 6% in 2016 and doubled that with a 12.7% gain in 2017. Since mid-December, this sector has been on fire, with gold ahead nearly 6% since then. Meanwhile, gold stocks are up 10.9% as a group, and they're quickly outpacing gold's gains. I think 2018 will turn out to be a breakout year for the precious metals sector. Gold prices have been on a tear since Bitcoin fell from its all-time high of more than $19,000 in mid-December. Since Dec. 11, the price of an ounce of gold has climbed from $1,242 to $1,313 today (Jan. 9), for a gain of 5.72% over one month. 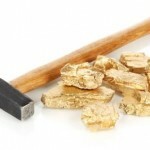 In fact, Money Morning Resource Specialist Peter Krauth believes gold prices will rise to $5,246 by 2020. That implies a profit opportunity of 300% from current levels. Krauth sees three major catalysts pushing gold prices higher over the next several years. If you're an investor, you need to follow Rick Rule on social media. He's a gold expert, and everyone knows gold is going to be one of the best investments of 2018. Bitcoin soared in price from $1,000 to $19,343 in 2017. That's an amazing 1,834.3% gain. Investors flocked to the digital currency for its potential to disrupt the financial industry. And because Bitcoin isn't backed by any government, some investors view it as a hedge against political instability and stock market corrections. Over the same period, the price of gold climbed from $1,242 to $1,310, for a 5.5% gain. That's a question we're getting a lot, because everyone knows gold is a great investment. Bitcoin - a high-tech, 21st-century investment vehicle if ever there was one - soared from $1,000 to nearly $20,000... and back down to $13,100. It has, of course, got everyone riveted. Stocks are going ballistic, too, with the market packing on more than 20% in gains over 2017. And so it's been easy to overlook that 5,000-year-old, decidedly non-virtual asset: gold. Its story hasn't been flashy; the yellow metal has had a tough time thanks in part to all those strong dollars sitting in optimistic, well-paid investors' pockets. But, as our Director of Research Matt Warder is about to show you, the bottom is behind us and the way upstairs is wide open for gold gains - possibly even extreme gains - in 2017. The biggest question on every precious metals investor's mind, probably without exception, has to be: "Have gold and silver bottomed?" It's the key to making smart - and profitable - buying decisions. Of course, nothing in the markets or investing is ever that simple. But today, we're going to look at some recent clues that strongly support a likely interim bottom for precious metals - and precious metal stocks, of course. We found a safe investment to make in 2018 for risk-averse investors. However, this investment could also net you a return of more than 300% in the next few years. Pie-in-the-sky gold predictions are a dime a dozen at this time of year - calls for gold to hit $3,000... $6,500... $10,000 or even more. Granted, most of these targets require at least the partial collapse of human civilization to work, although I have seen one or two loosely rooted in esoteric concepts like "economics," "monetary policy," and "central banking." Now... I'd be the first one to line up and sell an ounce of my gold holdings for $10,000 (provided the apocalypse hasn't happened), but we can't very well dream our way into profits; we've got to be realistic. Here in the real world, gold is pushing against some stiffening headwinds, although you'll see they're hardly insurmountable. After all, we've reaped tidy gold gains of 11% this year. I've got some great, historical charts you need to see that will prove my forecast is honest. Goldcorp just announced it would host next year's #DisruptMining innovation expo. If you look at gold's performance over the last few months, or even quarters, it would be hard to feel much excitement. Stocks are near all-time highs, oil is roaring back, and Bitcoin has blasted off. Meanwhile, gold sentiment is negative. Getting almost anyone excited about gold seems like a monumental task; it appears to be stuck in a trading range that's going nowhere fast. To call Venezuela "troubled" is a huge understatement. The oil-rich South American country is beset, really, by shortages of all kinds: spiraling inflation, a government that appears to grow more despotic and dysfunctional by the day, and of course, the raging civil unrest that comes along with these problems. Tellingly - and critically - the Venezuelan bolivar fuerte has been devalued three times against the U.S. dollar over the past eight years alone, from Bs2.15 to $1, all the way down to Bs10 to $1. This massive capital destruction binge was an attempt by late Venezuelan President Hugo Chavez to compensate for falling oil revenue. Now, this is not to depress you or bring you up to speed on recent Venezuelan history.